Chocolate Covered Oreo Fudge is a creamy chocolate fudge filled with chunks of Oreo cookies. If you love Oreo cookies, this is the fudge for you. And if you love the chocolate covered Oreos from the bakery, birthday parties, and holiday trays? You’re going to be thanking me for this Chocolate Covered Oreo Fudge with your very first bite. Inspired by my Chocolate Covered Pretzel Fudge, this fudge tastes just like chocolate covered Oreos. 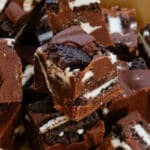 My kids went absolutely nuts over this fudge and I have to admit that I had a hard time resisting just one more taste each time I saw the fudge in the refrigerator. I like to cut the pieces extra small, making them perfectly snackable. 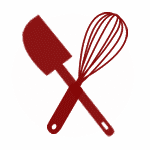 The holidays are a great time to play with recipes like this one. Fudge makes a terrific hostess gift and it’s also a great treat for a quick dessert. 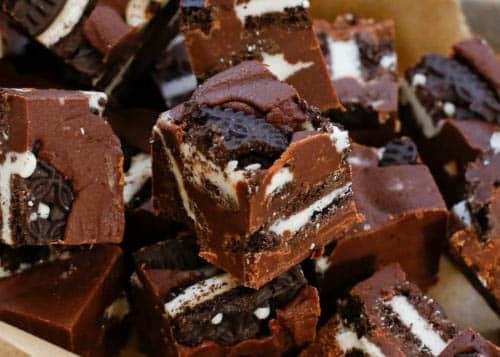 Chocolate Covered Oreo Fudge can be made ahead of time and then kept in the freezer for several months. Thaw in the refrigerator when ready to serve. This fudge can also be made with dark chocolate or white chocolate, if that’s more your style. Gluten-free chocolate sandwiches may also be used to make this a gluten-free treat. For more great fudge recipes, try White Chocolate Caramel Fudge and my kids’ favorite Creamy Peanut Butter Fudge. This Bailey’s Fudge and this Butterscotch Fudge are on my list to try later this year too. Kitchen Tip: I use these bowls and this pan to make this recipe. Combine the chocolate chips, the milk, and the butter in a medium size glass bowl and heat in the microwave for 90 seconds. Stir to combine and heat another 15 seconds. Stir and heat an additional 15 seconds, only if needed. There will still be a few pieces of unmelted chocolate in the bowl. Stir until mostly smooth with just a few flecks of unmelted chocolate. Add the extract and stir to combine. Stir the Oreos into the chocolate mixture, saving a few for topping. Press the remaining Oreos into the fudge. Chill until ready to serve. Slice into 1-inch squares. Store in an airtight container, separating multiple layers with parchment or wax paper. This fudge will keep nicely in the refrigerator for up to two weeks. Enjoy!